It’s obligatory when not a dyed-in-the-wool League of Ireland type and discussing the domestic game to have to rationalise supporting an English soccer team over the local variety. There probably hasn’t been a post about Waterford United on this blog that didn’t plaintively attempt it. It will be quite the novelty then to have to justify supporting the Blues over my real local team, i.e. Tramore AFC. I know so little about their activities that the only reason I found out they won the Premier Division of the Waterford Junior and District League for the very first time back in 2002 was because I had bought the local papers in the week after their triumph as souvenirs of Waterford’s Munster championship win. All this despite being on first name terms with the two men holding the cup on the front page. So how can I support the mighty once-played-Man-Utd-in-the-European-Cup Blues over poor ickle Tramore? Was it that, growing up in a GAA household, it never entered my head to follow the local soccer team? Or perhaps it was that living in Tramore Heights the real ‘local’ team were Tramore Rangers? It could be either of these things, but I’m going to plump for the Drums defence – there is no team worth supporting in Tramore once the Rookies went out of existence. Away and Google it if you know not to what I refer ye blow-ins! This was to be the first time the clubs had ever met in a competitive fixture, the lack of competitiveness of the friendly last February emphasised by Blues lending Kevin Burns to the Seagulls to play in goal. Let’s be grateful then for the opportunity presented by the Munster Senior C . . . what is Munster in soccer terms? Its status goes without saying in the GAA and Munster rugby existed even before Ronan O’Gara and co became the superest-duperest team in all of Europe (NB ‘Europe’ in this context excludes most of Europe). Do Waterford fans really get their blood up for a competition against teams from all over the province? I doubt it, and given Cork City won the competition no less than fifteen times during their brief existence, it’s likely the feeling was shared by just about everyone not Cork City-ish. At this point, it would be reasonable to query whether a blanket of volcanic ash descended on the RSC and caused the game to be called off. No, there was a match and once again the Blues didn’t let me down on the early goal front. Five minutes in and a corner to the near post was met by the stooping head of David Grincell. He was almost on his knees as he got down to the ball and flicked it across the line. It was an almost apologetic effort and Tramore would have been disappointed how easy he had it. It highlighted something that looked obvious even to an incompetent reader of patterns like myself – the gap in quality between the two teams. For years I would have assumed that the junior leagues, robustly competitive as they are, were on a par with the League of Ireland. Watching this game would suggest this is not the case. The Blues were stroking the ball around like it was a training session while Tramore were curiously shapeless and nowhere near as fired up as I would have expected. Mark McGhee recently speculated that the SPL could end up comparable to the League of Ireland, by which he meant – no disrespect – as low as you could go. Watching this, the League of Ireland is not the bottom of the heap. 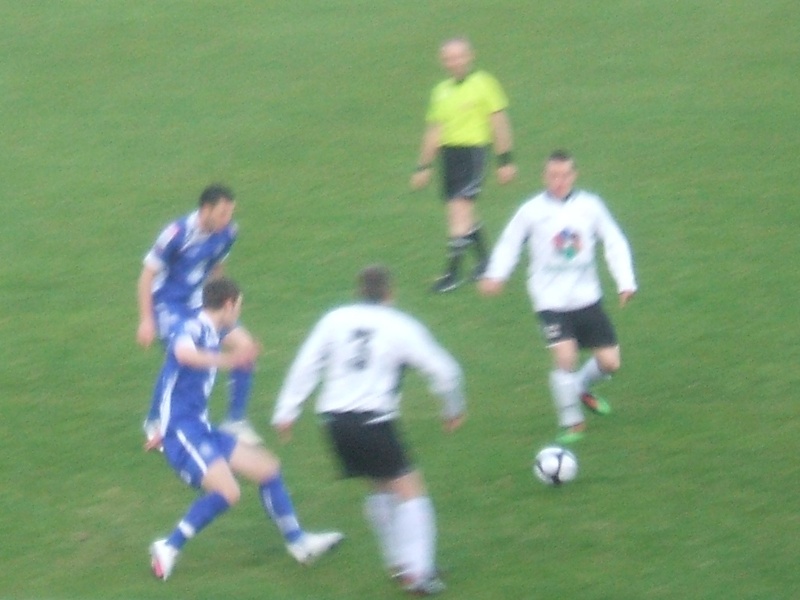 The match carried on at that low-octane pace, Waterford nudging everything around via George O’Callaghan, fancying himself as a right Xabi Alonso in the middle of the park, and Tramore playing catch-up. Gary Dunphy had one effort which fizzed just over the bar while Timmy Purcell twice saw decent crosses just nudged away and in to space where, luckily for Tramore, no Blue was present. At the other end, Tramore’s only real chance came via a goalkeeping clanger. Josh Byrne gathered a tricky cross with ease, only to lose the ball as he went to throw it clear. He picked it up again and the ref, correctly in my opinion, interpreted this as him throwing it to himself. Indirect free-kick, and the Blues were now the lucky ones as Tramore decided to change the focus of the attack by rolling the ball backwards which gave the wall time to charge forward and clear it. It was a break for Waterford, and they got another one five minutes before the break when a free-kick swung into the box seemed to hit a Tramore defender on the back of the head. It looped up into the path of Willie John Kiely who can’t have been more than a foot out to head it over the line. It was such a farcical goal that it took a good five seconds before I realised that it wasn’t going to be disallowed for something, anything. A goal it was, and 2-0 at the break was about right. 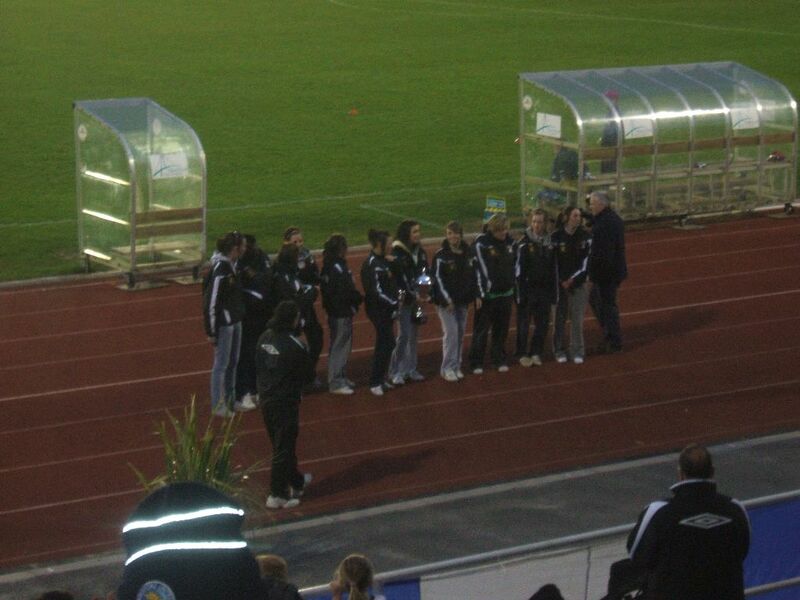 At half-time, the whole Munster thing came back into view as the Tramore girls team were presented to the crowd having won the Leinster Cup. I’m sure there’s a perfectly good reason why they compete in Leinster, no more unusual than Carrick United or Piltown competing in the Waterford leagues, but it shows that the provincial concept doesn’t have a strong hold on the domestic soccer mind. The second half was only different from the first half due to the conditions, increasingly slippery as a fine dew fell on the pitch. Otherwise it was business as usual, Waterford knocking it around and Tramore chasing shadows. Grincell had one good effort from distance well saved by the keeper but otherwise the most noteworthy incident was when the crowd managed to get a Tramore player booked, the player wellying the ball away after failing to keep it in play leading to several Ultras yelling that he had kicked it away. The ref was initially hesitant but, being the type who played strictly by the rules – no rolling free-kicks, throws taken from the exact spot where it crossed the line – he felt the need to brandish the card. You wonder though whether this played against Waterford a few minutes later when Tramore got a free-kick in a dangerous position. The kick was charged down but the ref immediately whistled up and booked the Waterford defender for handball. A bit harsh perhaps, but the ref had the best view. Now Tramore had a free right on the edge of the square. Watching it close-up, it looked so easy to score. Soccer goals are so big. Just get the ball over the wall and on target and no matter how slow the shot was the keeper would need to be eight foot tall to get across to it. I’m sure it’s more difficult than that but Leigh Quilty had the skill and Byrne barely moved as the ball sailed into the net (video of the goal here). Cue an eruption from the crowd which, as suspected, consisted of mostly Tramore fans. Game on, you would think, but George O’Callaghan had other ideas. Only a few minutes had passed when some good work down the right saw the ball come to George about thirty yards out. Goals from that kind of distance are rare enough but this was something really special as he barely took any backswing to stroke – ‘strike’ would be too violent a term – the ball right on the sweet spot to the back of the net. O’Callaghan’s signing has not been universally popular in Ultras land, but agnostics like myself will quickly be won over by efforts like that (video of the goal here). Tramore revival snuffed out then. It’s traditional at this point to suggest that they kept trying but generated more heat than light. I hope it doesn’t come across as mean when I say they didn’t even generate a lot of heat. Neither side was busting a gut. Tramore had one effort which required Byrne to nudge the ball over the bar while Purcell should have scored when given a clear sight of goal by Vinny Sullivan but he blazed over. In the last few minutes Kiely really should have put a more realistic gloss on the scoreline, successfully springing the offside trap, but having to come back to pick up the ball then turn and head towards goal left him with almost too much time and the goalie stood up well to beat away his effort. The game was petering out into injury time when some good approach work saw Tramore get into the box. Byrne seemed to have arrived at the ball just in time but the ref disagreed and awarded the penalty. Up stepped Quilty who rammed the ball home and suddenly we had an intriguing last ninety seconds. Although maybe not as there was nothing in the way of frenetic penalty area action in that closing period before the final whistle. Reading back through this stream of conciousness, I’m painfully aware of how dismissive it must seem. People in the domestic game are sensitive to charges that the product is dull, particularly from bar-stoolers who are routinely seduced by the English Premier League. If people chose to think I’m lacking in patriotism for the tone of this post, so be it. But I doubt if I’m alone among fans of Waterford United and Tramore AFC, and the many people who fall into both categories, in thinking this wasn’t a serious contest. There are worse ways to spend a tenner on a pleasant April evening, but in the week when the GAA moved ever closer to putting the Railway Cups out of their misery, it shouldn’t be seen as heresy to question the point of the Munster Senior Cup. 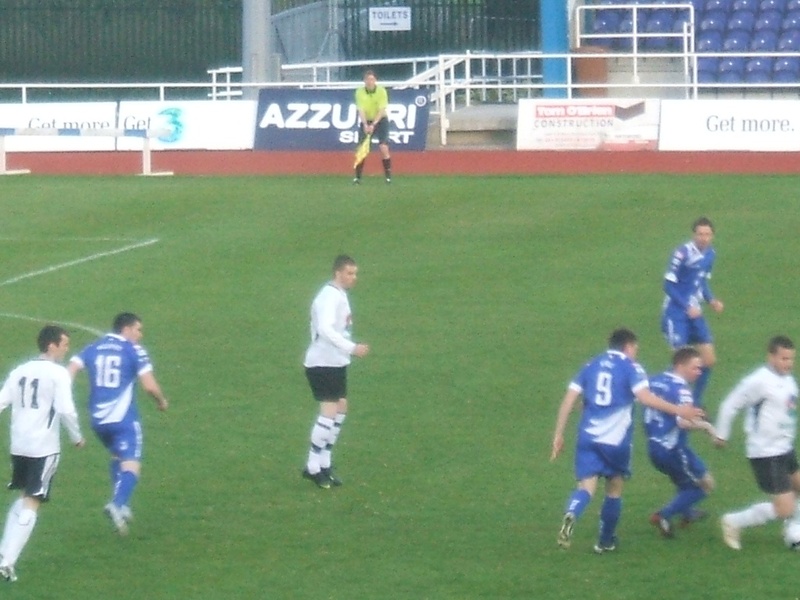 This entry was posted in Match Reports, Soccer, Waterford United and tagged Munster Senior Cup, RSC, Tramore AFC on 22/04/2010 by deiseach. This entry was posted in Soccer, Waterford gallery, Waterford United and tagged Munster Senior Cup, RSC, Tramore AFC on 21/04/2010 by deiseach. Back in the days when I had little interest in Waterford United – ah, happy carefree days – I was a mite defensive about not supporting the Blues, rationalising that if you were going to ‘follow your local team’ then Tramore Rangers (swanky new website, Rangers!) or Tramore AFC would be the logical choice. I’ve spent more nights in my life in Glastonbury than in the city of Waterford from whence the Blues hail whereas near or far, no matter where I roamed, my heart has always been with you, Tramore my home. And lo! it has come to pass that a choice must be made as Waterford United have drawn Tramore in the Munster Senior Cup. In truth, there is no conflict – the Blues come first. But it hammers home the great advantage the GAA enjoys by dint of the county loyalties that are intrinsic to the sense of identity of so many of us, loyalties that in a classic circular argument were forged by the GAA. That circle is not the biggest problem facing domestic soccer. But it’s a useful weapon in the GAA’s arsenal. PS note the Hon Sec for Tramore Rangers – it’s a small world. This entry was posted in GAA, Soccer, Waterford United and tagged Munster Senior Cup, Tramore AFC, Tramore Rangers on 07/04/2010 by deiseach. St Patrick’s Day – it’s a bit rubbish, innit? With that de rigeur sneer out of the way, we can dispense with the stuff about rivers of green vomit and admit that sometimes, like with any holiday, St Patrick’s Day can be great. The massacre of De La Salle in Croke Park notwithstanding, last Tuesday was one such great day. The parade in Tramore was a cheerful affair, surprising in a town without much in the way of community spirit and a country mired in the depths of an economic crisis that we thought would never hit us again. It was probably more the sunshine than anything else, but it was nice to see so many smiling faces. The biggest grin of the day was from my four month old nephew, if you discount the fact that you can hardly grin if you haven’t got any teeth. A few days after the game an image winged its way into my inbox of him catching some rays and generally enjoying the festivities in Port Laoise. Most notable from the perspective of those in chez deiseach was his head gear – a Liverpool woolly hat. Plenty to smile about in the aftermath of last weekend, eh? After a few flippant thoughts about the life of torment that is ahead of him following the Reds, it struck me that this was nothing compared to the horrors that are likely to be visited upon him if he were to take up the banner of Laois hurling. A life of torture and misfortune if ever there was one, and one that surely could be best avoided by nailing his colours to the mast of Waterford. Now, a lot can change in two decades. By the time he reaches his majority the roles could be reversed. Anyone born in 1960 would have considered it a no-brainer if they had been given a choice between following Waterford or Offaly. Still, while the race is not always to the swift nor the battle to the strong that’s the way to bet, and the odds are that Waterford will be competitive for a while yet while Laois people will not be piling in with the bookies for their championship prospects. There may have been a time when everyone supported the county of their birth, but geographical mobility has meant that those times are long gone, if they ever existed in the first place. Growing up in the dormitory town of Tramore where blow-ins were everywhere, it was perfectly normal for your peers to support the county of their forefathers. Indeed I was a Cork supporter of sorts back in the 1980’s, effortlessly switching my interest to the county of my forefathers once Waterford’s participation in the Championship had been terminated. It’s difficult to criticise those who chose to invest full-time in other more successful counties, like the friend who, having been told in 1986 that he could ‘go next year’, admitted to crying on the Croke Park pitch when he finally (ahem) got to share a Sam Maguire success with his fanatical Kerry father in 1997. It doesn’t stop me though. There’s an overwhelming temptation to scoff at those who don’t match up to a perceived standard of fandom. Supporting Waterford is not easy but you can genuinely draw comfort from that difficulty by congratulating yourself on sticking with it through think and thin – never forget that these days, whatever happens in All-Ireland finals, are firmly on the thick side. On the other side of the coin, reading the recent comment from the proprietor of FootballPress frowning at my concern over the fate of English club Liverpool while not even acknowledging the existence of the team ten kilometres down the road, my gut response was one of immediate defensiveness, a plaintive plea that I can’t invest time in every team in the locality. The problem for any localism zealot is that any person who supports a team from outside their hinterland can coolly rationalise their choice. Anyone who gives me gyp about following Liverpool will be slapped with the fact that I wouldn’t have met Mrs d were it not for following the Reds. It’s an ex post facto rationalisation – lots of Latin and italics today! – but seeing as it’s only the most important thing in my life, it’s one that does not brook argument. Other people always seem to have a relative or a significant event in their life that makes following an English team not only important but essential. Then there’s the question of how far localism can go. Surely the primary claim on my soccer affections should be Tramore AFC or Tramore Rangers. Then there’s people in Kilkenny who supported the Blues ahead of the late and unlamented Kilkenny City. Should they be switching their allegiances to their local team when they had the opportunity? Trying to construct a coherent narrative out of team loyalties is an exercise in futility. So where does all this self-serving rhetoric leave the nephew? It would seem self-evident that he will follow whatever path his father sets out for him, and with my brother being a man of strong passions this should be the case. But there is the caveat of our father’s experiences. A man of a much cooler temperament, he has always eschewed knee-jerk tribalism, regularly haranguing us for our collective lack of sportsmanship. This always moves us to respond that we want our team to win first last and always, and sportsmanship can go to hell – if winning is not important, why keep score? The perverse outcome of these attitudes is that our father now supports Waterford ahead of Cork because he wants to see us happy and sane. I can even see this in my own life. Previously I would have revelled in each and every defeat inflicted on England in all sports. I reject out of hand the idea that this reflects some kind of anti-English bloodlust. It is natural in sport to want to see Goliath brought down, and England are the Goliath in this part of the world. These days though, the memory of Mrs d racing from the room in floods of tears after yet another penalty shoot-out defeat is too much to bear. Sporting loyalties can be transmitted up and across generations as well as down, and it’s not inconceivable that in years to come father will be cheering for Laois against Waterford. And it would feel perfectly normal. This entry was posted in GAA, Hurling, Liverpool, Waterford, Waterford United and tagged England, Laois, Tramore AFC, Tramore Rangers on 22/03/2009 by deiseach.